Short Business Description: domilya GROUP is passionate about transforming our clients’ dreams into reality. Let us help you design and build the home of your dreams with our quality renovations. Our team takes a customer-focused approach to all our projects and customer satisfaction is our ultimate goal. We believe in exceptional workmanship and work with a talented team of certified designers, architects, and electricians to ensure that your renovation project goes smoothly, and the end result adds value to your home. 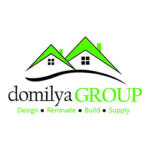 Let the pros at domilya GROUP use our industry experience and expertise to transform your house into a home.